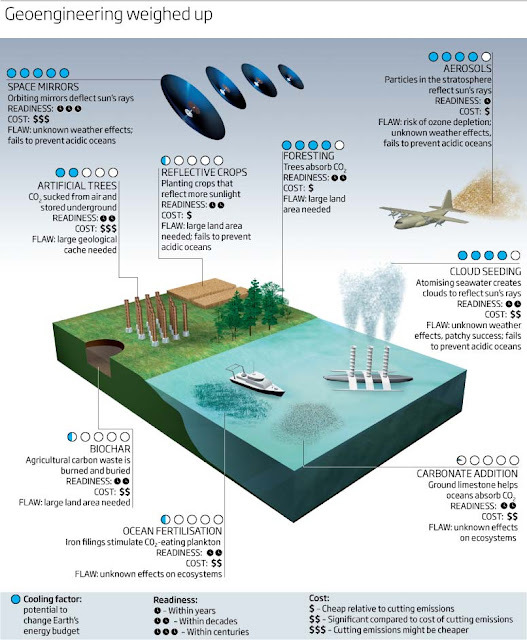 Geoengineering is the manipulation of the planet's environment ot combat, counteract, or correct anthropogenic changes in the atmospheric chemistry. As described in Geo-engineering; Geo-engineering is the study and implementation of technical ways to change (and arguably improve) things like weather patterns, river paths, soils, climates and sea currents on Earth. 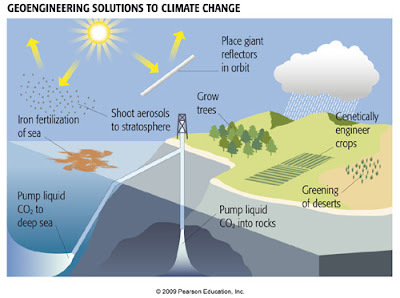 Recently, geo-engineering has received special attention for efforts to combat global warming. Carbon dioxide emissions from the burning of coal, oil, and gas have been increasing over the past decades, causing the Earth to get hotter and hotter. There are concerns that a continuation of these trends could have catastrophic effects, including crop failures in the heat-stressed tropics. This has led some to explore drastic ideas for combating global warming, including the idea of trying to counteract it by reflecting sunlight away from the Earth. However, it has been suggested that reflecting sunlight away from the Earth might itself threaten the food supply of billions of people. New research led by Carnegie's Julia Pongratz examines the potential effects that geoengineering the climate could have on global food production and concludes that sunshade geoengineering would be more likely to improve rather than threaten food security. Their work is published online by Nature Climate Change. Big volcanoes cool the planet by placing lots of small particles in the stratosphere, but the particles fall out within a year and the planet heats back up. One proposal for cooling the planet is to use high-flying airplanes to constantly replenish a layer of small particles in the stratosphere that would scatter sunlight back to space. But such so-called sunshade geoengineering could have unintended consequences for climate, and especially for precipitation. Although scientists know that climate change in recent decades has negatively impacted crop yields in many regions, the study by Pongratz and colleagues is the first to examine the potential effect of geoengineering on food security. Pongratz's team, which included Carnegie's Ken Caldeira and Long Cao, as well as Stanford University's David Lobell, used models to assess the impact of sunshade geoengineering on crop yields. Using two different climate models, they simulated climates with carbon dioxide levels similar to what exists today. A second set of simulations doubled carbon-dioxide levels – levels that could be reached in several decades if current trends in fossil-fuel burning continue unabated. A third set of simulations posited doubled carbon dioxide, but with a layer of sulfate aerosols in the stratosphere deflecting about 2% of incoming sunlight away from the Earth. The simulated climate changes were then applied to crop models that are commonly used to project future yields. The team found that, in the model, sunshade geoengineering leads to increased crop yields in most regions, both compared with current conditions and with the future projection of doubled carbon dioxide on its own. This is because deflecting sunlight back to space reduces temperatures, but not CO2. "In many regions, future climate change is predicted to put crops under temperature stress, reducing yields. This stress is alleviated by geoengineering," Pongratz said. "At the same time, the beneficial effects that a higher CO2 concentration has on plant productivity remain active." Even if the geoengineering would help crop yields overall, the models predict that some areas could be harmed by the geoengineering. And there are other risks that go beyond the direct impact on crop yields. For example, deployment of such systems might lead to political or even military conflict. Furthermore, these approaches do not solve the problem of ocean acidification, which is also caused by carbon dioxide emissions. "The real world is much more complex than our climate models, so it would be premature to act based on model results like ours," Caldeira said. "But desperate people do desperate things. Therefore, it is important to understand the consequences of actions that do not strike us as being particularly good ideas." "The climate system is not well enough understood to exclude the risks of severe unanticipated climate changes, whether due to our fossil-fuel emissions or due to intentional intervention in the climate system," Pongratz said. "Reducing greenhouse gas emissions is therefore likely a safer option than geoengineering to avert risks to global food security."